Looking for a range of superior quality bed linen and bed sheets? ShopLinens.co.uk offers a range of desirable brands like Sheridan, Christy, Dorma, Helena Springfield, Gingerlily and many more – all at competitive prices. At ShopLinens.co.uk, we stock sheets both fitted and flat for unusual size requirements. In addition, we stock difficult to find fitted sheets for four foot beds in ivory and white. 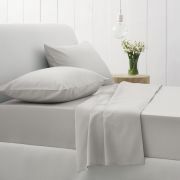 We also stock flannelette fitted sheets, or brushed cotton bed linen – both ideal in winter, especially for children, as it feels warm to the touch. For the ultimate in luxury, why not consider Gingerlily 100 percent ivory silk sheets? They are available in all sizes in both fitted and flat styles, and the range is complemented by equally sublime duvets, pillows, cushions and pillowcases. The range is popular among female shoppers, as sleeping on silk reduces the likelihood of lines around the delicate eye area and is conducive to looking fresh first thing in the morning. In addition, the silk is kinder to hair and leaves it less tangled after a long sleep. For this selection, as well as other exquisite ranges of bed linen and bed sheets in Ireland, ShopLinens.co.uk is the ultimate one stop destination.